Kids in school are counting down the last days before the holiday break, college students are looking forward to the back side of their finals, and it's impossible to avoid Christmas music in every grocery and department store. As of today, there are only two weeks until Christmas. We know that there are a lot of things on the to-do list, including finishing shopping, mailing cards to friends and family, and baking treats for the neighbors. It's hard enough to get all of those done while also prepping the house for guests. So here 12 quick, easy, and cheap things to do in order to get the house clean and ready for your guests before you see their headlights pull up in the driveway. 1. Follow a Deep Clean Schedule- Getting all of the cleaning done can be a daunting task, but is very manageable if it's taken one step at a time. 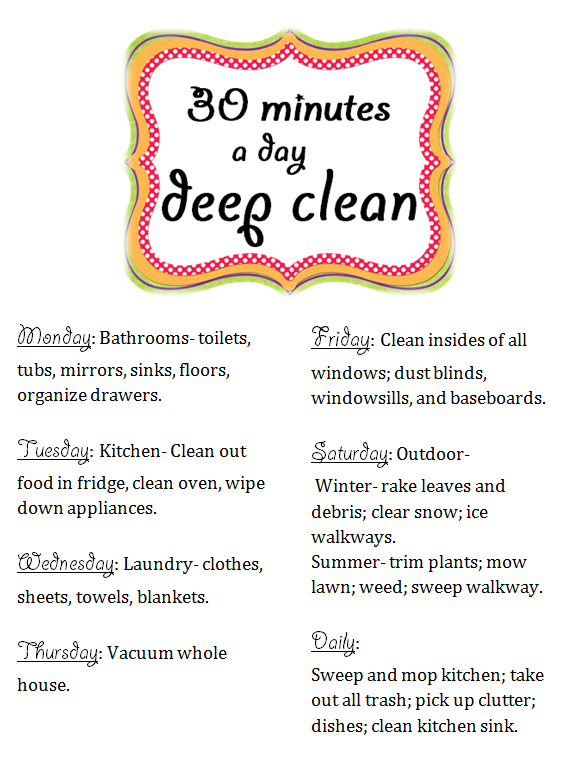 Here is our 30 minutes a day deep clean schedule. 2. Clean the Carpets- Through rugdoctor.com, you can find a place to rent a machine and also find a coupon. Or, if you plan on continuing to clean your carpets, invest in a carpet cleaning machine which usually runs between $100 and $150. Cleaning them yourself can take a couple of hours (and will need time to dry, especially during winter- be sure to turn up that heater! ), but is well worth the time once it's finished. 3. Add Area Rugs- In places that have large stains, or just need a pop of color and style, add some area rugs. Good places are under the dining room table, in front of the couch, the entry way, by beds, or down a hallway. 4. Add an Accent Wall- One gallon of paint is around $20, but depending on the size of the wall, you may be able to buy a couple of pints. Pick a fun, new color, and use an afternoon to paint an accent wall. It will give the room a completely new and fresh look. 5. Update Lighting Fixtures- Updating lighting fixtures allows you to add personal style quickly. Also, some lighting fixtures don't always light up the space as well as they could. New fixtures make a big impact and gives you the opportunity to brighten up any space. Check out our sister site for lighting fixtures at lighting49.com. 6. Replace front doorknob- Another easily updated piece in your house that makes a huge impact is the doorknob on the front door. For a total makeover, also think about painting the front door! 7. New Switch Plates- Most switch plates are very affordable at any home improvement store. Change out your old ones to update any room quickly. Or, if you're very creative, refurbish your old ones with paint or other decorations. 8. Patch Grout in Bathroom and Recaulk- Grout chips and cracks away after a while, so luckily it's easy to fix. Get some grout that matches your color and patch up the holes. Make sure the existing grout isn't wet before patching on top of it. Another necessary chore is to recaulk around the tub. This will protect the grout and glue, and make it easier to clean. 9. New Shower Curtain, Bath Mat, and Towels- A cheap way to make a huge statement. Completely update the whole look of your bathroom with new accessories. There are endless possibilities with colors, patterns, and textures. 10. Declutter with New Storage- Adding some big plastic bins in the garage or organizers in bedroom and linen closets allows for better organization. Having things organized well makes it a lot easier to clean up and keep things in their place. 11. Add Molding- Install some crown molding or a chair rail molding for a fresh and classy look. Paint it, nail it it, patch the holes, and paint the patches. 12. Window Treatments- Curtains and valences make a huge statement in the room, and often sets the mood. Change it up with new curtain rods as well. 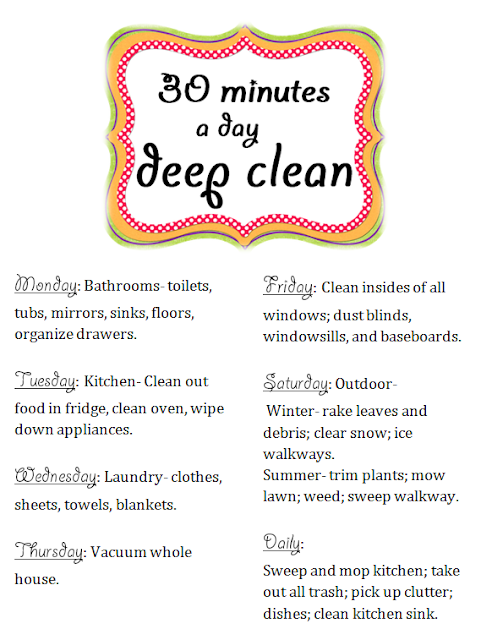 If you've figured out how to do all your laundry in 30 minutes, please share. You need to clean all your products which are present in home. Get Area Rugs On Sale from Rugstown where you will get discounted carpets at reasonable cost.